The Continental Market at Belfast City Hall. Carrick’s maritime area could be bustling with stalls this spring following an invitation to stage a popular continental market in the town. It comes as Mid and East Antrim Borough Council was approached by Market Place Europe Ltd, which runs the annual Christmas event at Belfast City Hall. 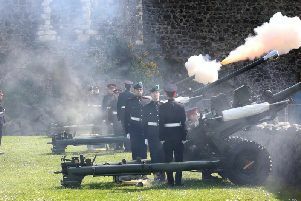 Carrickfergus Castle could be the backdrop for the event this May. The council-owned car park adjacent to the Castle is the suggested venue for the event, which would run from May 18-20 if given the go-ahead. “There will be an opportunity to involve some of our own local agri-food clients in this event,” the report added. There are also hopes the market would “enhance” nearby events taking place over the same weekend, including the commemoration of the Battle of the Hitler Line (May 19) and an MC Car Club function (May 20) at Joymount. It is understood that planning for the event is still in its early stages, with the council due to have further discussions on the proposals in the coming weeks.